Yesterday, the Roman Catholic Church got a new Pope: Pope Francis, né Jorge Mario Cardinal Bergoglio. The former archbishop of Buenos Aires was a bit of a surprise pick, as Cardinal Bergoglio was on almost none of the lists of likely candidates floated by the experts and pundits. I was expecting a surprise, but not one of this degree. This new Pope Francis is already an unexpected sort of pope. Francis is, as many have already pointed out, the first non-European pope in over a millennium. Better put, he is the first pope who is from neither the Mediterranean world nor from Europe. He is from Argentina, the son of Italian immigrants. It is easy for people from the United States to forget that we were not the only American country to experience large-scale immigration in the late 19th and early 20th century. Argentina in particular was an immigration magnet, in various eras even encouraging mass immigration. Everyone talks about Germans in Argentina, but Italians were the largest immigrant group. As a second generation immigrant, he is a native Italian speaker with a Spanish first name. So while he is the first Latin American pope, he might be eligible for Italian citizenship by descent. The novelty of his national origin manages to be surprisingly in line with the tradition of Italian popes. The new pope came from a humble background; his father worked on the railroad. Francis first trained to be a chemical technician before joining the Society of Jesus in 1958. They have the longest educational process of the major Catholic religious orders, taking 8 to 14 years to complete. Even the scholastics who are not being prepared for professorships are provided with the kind of education that a young working-class man could only dream of affording. He was ordained a priest in 1969, making Francis the first pope whose entire priestly career took place in the post-Vatican II era. In fact, during the last two years of the council (which met 1962-65), he was teaching high school literature . Pope Francis’ above-mentioned membership in the Society of Jesus is also historic. Since their start in 1540, the Jesuits have been distinctive for their “fourth vow”. 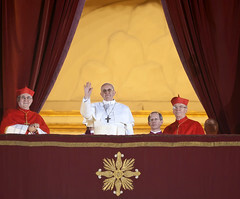 In addition to the normal vows of chastity, poverty, and obedience, they make a special vow of obedience to the pope. This fourth vow has often served to place members of the Society at the pope’s disposal for special tasks and missions. As a result, Jesuits have often been dispatched as “fixers”: commissioned to reform a monastery or other Catholic institution, tasked with establishing missions in unevangelized lands, or sent to preach against heretics (including Jansenists or Protestants like me). The special vow of obedience, along with the Jesuit rule against ambition for church offices, has often been considered a practical impediment to a Jesuit becoming pope. However, ordinary vows of obedience are superseded by episcopal ordination, since (1) canon law clearly states it, so that a bishop is not kept from doing his job, and (2) bishops are appointed by the pope anyways. The vow “to not ambition” is satisfied by reminding the one offering the position that a Jesuit is not to seek high office. So being elected pope, and being urged to accept the nomination, arguably makes the fourth vow a non-issue. But special vows are not the only reasons it took the better part of five centuries for the Jesuits to produce a pope. They were controversial from the start, and often even Catholic governments suspected them because of their perceived tie to the papacy. Political opposition to their work was so strong that Pope Clement XIV was pressured to suppress them in 1773. Except in Russia and parts of Prussia, the order was dissolved. Pope Pius VII, after his return to Rome from political exile, restored the Society in 1814. The Jesuits prospered after the restoration, despite continued hostility from several governments. More recently, many Jesuits have clashed theologically with Vatican authorities. In particular, Jesuits were active in the Liberation Theology movement in Latin America. These and other trends put the Society on a collision course with Pope John Paul II. The most dramatic confrontation between the Society and the late pope came in 1981, when John Paul imposed a conservative interim leader on the Society. Since then, it has been a commonplace to say that the Jesuits are in disfavor with the Vatican. But there is another Jesuit legacy, one that is less remembered in light of recent controversies. Ignatius Loyola’s first priority in founding the Society was to advance the vision of spiritual renewal contained in his Spiritual Exercises. The original Jesuit constitutions were also developed with an eye towards church reform and fighting church corruption. Hence the prohibition against ambition for church office, provisions for simplicity of dress and of liturgical practice, and the limitation of opportunities for wealthy would-be patrons. The new pope seems to be that kind of Jesuit. While Pope Francis professes a great care for the poor, he opposed the inroads of Liberation Theology in the 70’s and 80’s. He urged Jesuits under his jurisdiction not to abandon parish work and insisting on a traditional approach to Ignatian spirituality. While his elevation to the papacy is surprising in light of recent tensions between the Jesuits and the Vatican, in a sense he has just been given the ultimate task for a Jesuit fixer: to reform the corruption, cronyism, and bureaucratic inefficiency that has been exposed in the Vatican in recent years. As for his chosen regnal name, Pope Francis has also proven to be precedent setting. Since Pope Lando in 913, every pope has taken a name that was used by at least one predecessor. The one partial exception, John Paul I in 1978, took the names of his two most recent predecessors (John XXIII and Paul VI) and combined them. By taking a new name, the new pope has broken with convention. But in a very interesting way. He has still taken the name of a major figure, probably the most influential non-pope and most popular saint in second millennium Catholic history: Francis of Assisi. There is nothing unconventional about admiring Francis of Assisi; even most Protestants join the fun. Francis was a very active, and very boldly verbal, preacher. He even went so far as to go before the Sultan in Egypt during a crusade and attempt to convert him through preaching. In addition to preaching, Francis of Assisi and his companions were concerned with the renewal of the church. Early in his career, he had a vision in the church of San Damiano outside of Assisi in which Christ told him, “Francis, Francis, go and repair My house which, as you can see, is falling into ruins.” And so the stories tell us one of the first acts of his ministry was to literally rebuild a church. And that is an apt description of the great friar’s goals. And wrapped up in that was his rejection of special honors and his embrace of a life of poverty. He went so far as to refuse to accept ordination as a priest. This pattern of humility in many ways was as much a rhetoric as a lifestyle. The official clergy were often criticized for lax living. Most dissenting teachers, especially among the Cathars, attempted to surpass the mainstream church in asceticism and simple living. For many, the self-denial of the dissenters was far more appealing than the pomp of the bishops and abbots. Francis and his followers found, therefore, than living a life of poverty and begging gave them a voice where the church was weakest, and a degree of honor that not even the Pope could overlook. Given pressures facing the Catholic Church is recent years, Pope Francis probably seeks to claim that legacy of St. Francis. One of the main concepts advanced by popes Benedict XVI and John Paul II has been “new evangelization”: renewal of faith within the church and a renewed mission in the places where the Catholic Church has been marginalized by secularization. Indeed, Pope Francis has been involved with a major “new evangelization” movement known as Communion and Liberation. Pope Francis is also known for rejecting the high-end archbishop’s residence in Buenos Aires in favor of a simple apartment, cooking his own meals, and using public transportation. He often avoids wearing some of the more elaborate vestments that he has the rights to wear. These actions have helped him to earn respect even as he has taken many controversial stances in his home country. (All of which will no doubt be thoroughly aired and dissected in the coming weeks and years.) These aspects of the new pope’s personal history suggest that he claimed his namesake in part because he adopts a similar posture towards and rhetoric of spiritual leadership. pauses as if speaking off the cuff. (This is where the video conveys a lot more than transcripts.) He still knows how to have the common touch. And, as sincere as he seemed to be–and as I trust he was being–I can’t help but suspect it was an intentional touch. With all the buzz among the cardinals about curial reforms, and the undignified leaks from last year that revealed cronyism and infighting within the Vatican, and given his status as an outsider to the Vatican’s agencies, he probably has some housecleaning in mind. And, given the demographics of the Vatican staff and senior officials, that will mean firing, demoting, or pushing aside a lot of Italians. Which means that approaching the Italian public with a common touch, emphasizing his Italian roots along the way, will help smooth the feathers that might be about to be ruffled. Remember, formal and public expressions of humility are an ancient source of prestige and political leverage for the Papacy. With all the conventional talk about the papal armies and papal wealth of old, the main power of the popes has always been soft power. Diplomatic maneuver, moral suasion, religious and personal appeal almost always extended far further than the armies of the Papal States.Even some of the papal titles, most notably “Servant of the Servants of God”, combine a conventional humility with a bold claim of authority. And the main sources of coercive power that the popes have, namely canon law and church censures, are only as strong as the spiritual respect that people have for the papal office. That is why Stalin is considered foolish for exclaiming, “The Pope! How many divisions has he got?” So while Pope Francis broke with several more recent customs in his first public appearance, he is tapping into something that has historically been a source of strength for his new office. It is, as I said above, to early to tell how Pope Francis’ reign will unfold. But his his distinctive personal background, the humble-but-profound choice of regnal name, and the paradoxical power of his air of personal humility give him a lot of potential. What he does with that potential, time will tell. Very helpful article. Everything I’ve been reading about him makes me want to root for Pope Francis–even as a Presbyterian. thank you for this informative essay….2 thoughts: could not help but think of Peter the Fisherman suddenly appearing in the square below yesterday and wondering who the heck the guy is white was – and secondly, Martin Luther’s theology of the Cross expressed in the Heidelberg Disputation 1518 – all those claims to humility strike me as signs of the theology of glory not the Cross.